The article, if read with a critical eye and an understanding of business tactics and strategy, contains valuable information about the interest groups that are banding together to oppose any effort to treat nuclear generated electricity like the high-quality, emission free-product that it is. It qualifies as a smoking gun because it openly lists a couple of trade groups representing competitive suppliers with a strong interest in permanently driving nuclear generators out of the market. The coalition comprises groups including the Pennsylvania Manufacturers Association, AARP, Pennsylvania Independent Oil and Gas Association and Marcellus Shale Coalition. The coalition that the interest groups have formed is deceptively named. It’s not a citizens’ group. Though AARP might qualify as representing citizens, few reasonably intelligent and politically aware people would classify the Pennsylvania Manufacturers Association, the Pennsylvania Independent Oil and Gas Association or the Marcellus Shale Coalition as representing citizens. It would be a good bet to predict that future references to the group may not include open recognition of the fossil fuel lobby groups with a direct business interest in opposing temporary financial assistance that keeps struggling nuclear plants from leaving the market while under severe pricing pressure. Though I have not studied any proposals for Pennsylvania, I suspect they will be modeled on the Zero Emission Credit programs that have been implemented in New York and Illinois. Those programs have the effect of putting a floor under the prices paid to nuclear generators; when wholesale market prices return to more normal levels, the subsidies phase out. Though you will probably never hear this outside of a closed door conference room, I suspect that there have been conversations about the need of gas interests to band together in a “grass roots” effort to convince the public and the politicians to take action. ZECs interfere with the price war against competitive electricity suppliers. If the ZEC keeps the nuclear plants operating, gas suppliers will not achieve their goal of increasing their market share and restoring their pricing power. Replacing 1000 MWe of nuclear generated electricity would require burning about 180-200 million cubic feet of natural gas every day. That is enough to make a small, but steady difference in the supply/demand picture, both during the “injection” season and the storage consumption season when the demand for space heating kicks in. In addition there is no doubt that burning gas produces far more air pollution and CO2 than the emission-free operation of a nuclear plant. The natural gas industry has done a terrific job in marketing its product as a lower carbon and lower pollution alternative to coal, but it has logically never tried to make a cleanliness case against nuclear. It would be a complete failure or fabrication if it tried. Once nuclear plants are forced to close, natural gas prices will inevitably rise. Profits will improve for the suppliers. There will be a ripple effect that results in some distributed, often temporary job growth associated with new drilling and new pipeline infrastructure. The immediate negative effects of the closure will be concentrated in the communities near the power plant and especially in the families of the skilled workers who are displaced. There is little doubt that most of the younger workers will be able to eventually find other work, but it will often require a disruptive move, a cut in pay and a reduction in seniority. Workers who are closer to retirement might be forced to become Wal-Mart greeters if they do not have sufficient savings to actually retire yet. Communities near closed nuclear plants rarely recover the pleasant, steady middle class prosperity that they enjoyed while the plant was operating. Instead of hosting a valued, productive, clean energy production plant that pays a big chunk of the local tax bill, the community becomes the home to a white elephant on a large site. What was a terrific, infrastructure-rich power plant site becomes a cluttered clean-up chore with massive foundations and stored materials that inhibit reuse. I learned last week during my trip to Pittsburg that Pennsylvania is the second largest energy exporting state in the U.S. Texas is the only one that sells more energy in the form of coal, oil, gas and electricity to its neighboring states. Those products help bring money into the state that is then used to purchase those products that the state is not so skilled or experienced in producing. In contrast to Texas, Pennsylvania exports all four major energy products; Texas produces little coal and has a grid that is virtually walled off from the rest of the country. It would be better for the state’s economy to resist interest groups seeking short term profits by increasing the in-state demand for natural gas. Perhaps there is a viable way to convince oil and gas suppliers that Beaver Valley and other nuclear plants should be seen as partners in the effort to increase exports of valuable Pennsylvania products. Such cooperation capitalizes on the state’s core competencies and brings a growing stream of outside money into the state. According to the Citizen’s United decision of the SCOTUS, corporations are people too, so I guess it could technically be a citizens’ group, lol. Good luck with that. I’m sure those groups see that if PA nuclear plants are shut down, then PA gas-fueled electricity plants will have more business *both in and out of state* (because if PA nuclear plants are exporting electricity, that is electricity that PA gas-fueled plants could be exporting instead) and the gas producers can pass on higher prices to those gas-fueled plants. Seeing as no other states are really planning much in the way of new nuclear build, at this time, there is little threat to PA from out-of-state nuclear, and so no reason to keep around in-state nuclear. A flaw in your logic is the fact that there are far more gas consumers than gas producers in Pennsylvania. That give nuclear plant operators a strong argument for pealing off such interest groups as the Pennsylvania Manufacturers by producing high quality analysis of the effects of a tighter balance between supply and demand for natural gas. Home heating costs are also likely to increase, but nuclear proponents need to make a solid case and make it very publicly. Perhaps I misunderstood your comments. It sounded to me from your text that you thought the gas producers could be convinced to be allies of nuclear in the name of exporting more energy. If you are talking to all the other people in the state of PA, then, yeah, if people can be convinced to think rationally about their self interests as a state, I think nuclear is in the self interest of every state. I just don’t think it would be easy to convince gas producers that nuclear can be their ally by competing with them for energy customers both domestic to a state/nation, and for exports. may be useful to some. 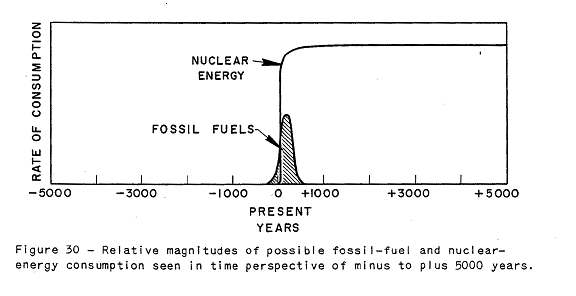 And yes, by fully utilizing the energy available in uranium, also thorium, the nuclear portion of this graphic is realistic. ROFLMAO!!! So, how are those flowery predictions about a new beginnig for NE under this lying treasonous administration working out for you, Rod? I see Exxon has just applied for exemption from the sanctions against Russia, right on the heels of Tillerson meeting with the Russians. And still you do not use your bully pulpit to patriotic purpose, instead opting to pursue an agenda doomed by the very forces you championed. Tillerson, Pruitt, these are NE’s enemy, as well as the enemies of the people, our chidren’s future, and the health of our planet. And you just prattle. I think you are straw manning Rod’s position a bit. I don’t think he ever stated definitively that Trump would be good for nuclear energy, but rather, wrote articles with an eye towards trying to convince Trump to embrace nuclear. Which may or may not happen; looks like probably not – but, as soon as you define Trump as the enemy, you lose all hope of getting any cooperation from his administration; why make enemies if you don’t need to? Of course, if they champion policies and regulations that undercut Nuclear (as it seems they are on the road to doing), you do eventually need to ‘cut bait’, and then try a different strategy. In any case, I don’t think Rod is a “champion” of the Trump administration. I think that’s a misrepresentation. Jeff, I have to disagree with you. Going along to get along is a form of championing. Rod has a bully pulpit. And that bully pulpit comes woth a responsibility. Barely 90 days in with this administration, and the level of uncompetence, malfeasance, dishonesty, and corruption is unprecedented in our entire bistory. Do you think these groups, such as this thread is occupied with, exist in a vacuum? Are not emboldened by Trump’s cabinet choices, words and deeds? Yet Rod has consistently chose to offer absurdly optimistic essays. And when he strays from the sacharin, and offers criticism such as we see on this thread, nary a mention of how Trump’s slither into office has provided a comfortable environment for the oil industry to stifle innovation and progress in the energy sector, based on voodoo science and a complete lack of environmental concern. For years now we have seen Rod decry the efforts of the fossil fuel industry, in a vast conspiracy, to undermine the use and scientific wisdom of nuclear energy. But now, with the foxes running rampant in the hen house, all we get is an occassional weak squeek, and more often than not an optimisic bit of blather that is in full flight from reality. Its time to fight, put up, or shut up. Heres a Trump admin. plan to increase solar output to 10 terawatts by 2030. Care to show us a comparable Trump plan for NE? Ramp up coal through deregulation. Restart two pipeline projects. Deregulate fracking. Advocate and plan for expanded solar. Make a sleaze play for Exxon to slither under the Russia sanctions in order to develop oilfields. Gee, Rod, whats missing from this list? And by the way, just ran a search on Perry. Uhm, seems he is pretty much irrelevent. Oh well. Hooda thunkit? “Though AARP might qualify as representing citizens . . .” I don’t know to what extent most members of AARP would support this coalition or any other. I’d guess that most members are more interested in the insurance offers than in any kind of citizen coalitions. A friend talked me into signing up when I turned 50, and I dropped out after a few years of chucking unread magazines into File 13.